Lightning Shroud: Guild Ball: The Farmer's Guild, Painted! 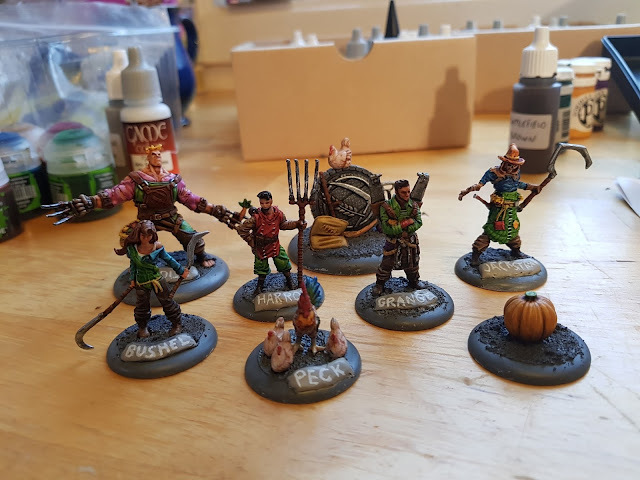 I am done painting my second team - the Farmer's Guild "The Honest Land" starter box. The players are Windle, Bushel, Harrow, Peck, Grange and Jackstraw, also there is a pumpkin ball and the goalpost. I wanted to paint them as a team, but also to have some fun with the color palette. I prefer a high contrast scheme to make it look good at a distance. I chose to repeat several browns and the bright green on every model. I also wanted to have some unique colors for each model to spice it up a bit. Windle got a pink shirt (the big softie! ), Bushel a PP Arcane Blue shirt, Harrow a deep PP Skorne Red Base coat, Jackstraw a PP Cygnar Blue Base shirt, and Captain Grange just got the general color palette. All of the models got base coated. Then I used a bunch of different Citadel washes, and picked out the highlights. The bases are quite simple, just covered in Citadel Astrogranite, a type of paint with grains mixed in. It is smeared about with tools instead of a brush. I also added a nameplate (just a bit of green stuff) to make the models easy to identify.